After enduring car accidents when she was a young woman - none of which were her fault - Mary Steinhoff was left with chronic, debilitating pain that lasted for 29 years. “I was in constant pain, [from] head to toe, ” the 56-year-old from Morrisville, North Carolina said. In fact, the pain was so bad that she couldn’t raise her right arm or lie flat. As a result, she battled insomnia and fatigue, sleeping just 2 to 3 hours every night for years. It was also challenging to drive and impossible to concentrate or read a book. “It can be an excruciating journey physically, emotionally and spiritually, ” she said. It wasn’t until 2002 that she was finally diagnosed with fibromyalgia, but she continued to live in pain as she tried virtually every treatment available: physical therapy, massage, aqua therapy, acupressure, medication, yoga, psychotherapy and prayer. She even bought a new mattress, tried a gluten-free diet and stopped eating sugar - nothing helped. “I was desperate to fix this, ” she said. Drury discovered that Steinhoff’s atlas, or C1 vertebra, was tipped 4 degrees forward, which meant that her neck was flat. Since it didn’t have a natural curvature, it was impossible for her to lay flat. He also discovered that her upper cervical spine was not only turned to the right, which caused her spine to turn left, but it was also severely twisted. After her first upper cervical adjustment, Mary returned home, took a shower and started sobbing. When her chusband walked in, alarmed, she rejoiced, “It doesn’t hurt to wash my hair!” “It was startling to say the least, ” she recalled. 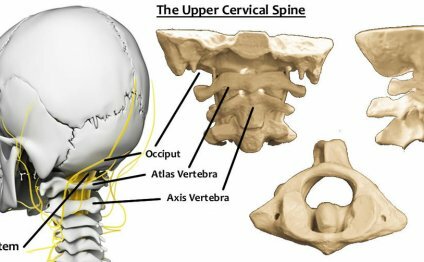 The concept of upper cervical chiropractic has to do with the brain stem, which comes out of the head through the top two bones of the neck, known as the atlas (C1) and axis (C2). The brain stem works like a switchboard operator, controlling all of the messages between the brain and the body. “If one of those bones gets even slightly out of line it can interfere with the messages between the brain and the body, ” Drury said. In fact, a recent study conducted in Italy found that upper cervical chiropractic adjustments on patients with chronic venous cerebral-spinal insufficiency and multiple sclerosis had improved function in multiple areas of the body after just 6 weeks (See story on back page). “We don’t treat conditions, we treat the body. When everything is balanced and nothing is interfered with, the body is a self-healing organism, ” Drury said. “As it holds longer, they need to see us less and less, ” Drury said. A treatment can also cause soreness, particularly if you’ve had pain for several years. The aim of the study is to evaluate the clinical and X-ray results of the Upper Cervical Chiropractic care through the specific adjustments (corrections) of C1-C2 on patients with chronic venous cerebral-spinal insufficiency (CCSVI) and multiple sclerosis (MS). We studied a sample of 77 patients before and after the upper cervical chiropractic care, and we analyzed: A) The change of the X-ray parameters; B) The clinical results using a new set of questions. The protocol of the C1- C2 upper cervical chiropractic treatment, specific for these patients, lasts four months. From a haemodynamic point of view we divided the patients in 3 types: Type 1 - purely vascular with intravenous alterations; Type 2 - "mechanical" with of external venous compressions; Type 3 - mixed.